National Register of Historic Downtown Sites in November, 2002. 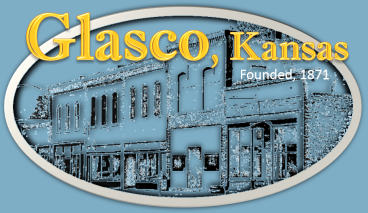 The Cloud County Stained Glass Tour includes all four Glasco's churches. Each church contains distinguished stained glass, some very old, as in the Christian and Catholic churches, and some contemporary, as in the Methodist and Lutheran churches. Glasco gained nationwide notice as a route pit stop for the 1995 and 1997 Sunrayce -- a solar powered auto race. Now known as North American Solar Challenge drivers participating in this Indianapolis to Colorado Springs contest, stopped their specially designed cars "downtown" to eat and change drivers. Race fans, participants, and college crews gave Glasco high praise for their warm welcome. The Glasco City Library, located in the City Hall Building on Main Street, regularly displays unique collections of memorabilia and art. Drawing on the resources of the community, the art committee presents amazing exhibits ranging from tea pots to Indian artifacts, from aprons to eggs and valentines. We value the tradition of supporting the community & its institutions. ﻿Glasco’s website is partially supported by the Steve Schrandt Memorial Fund in recognition of his services to the community.